A comprehensive and authoritative guide to the healing powers of Japanese foods, this book includes an in-depth look at over seventeen traditional ingredients, including miso, shiitake, toasted sesame oil, tofu, amazake, and seitan. Each food item is given its own chapter, which includes a detailed discussion of the nutritional and medicinal benefits, how to make it or buy it, cooking with it, and recipes featuring it. This book also features a pronunciation guide, which is great for ordering from restaurants or shops, and a guide to composing meals. 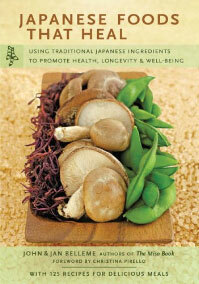 Includes 125 delicious recipes to show you how to include the healing foods of Japan in your everyday diet.